At the February 2018 District Board of Trustees, Cady and Eric Johnson were recognized and thanked for their longtime support of the Polk State College Foundation. Over the past several years, approximately $10,000 has been donated in support of student scholarships and programs. Eric, who works for UBS Financial Services, Inc. in Winter Haven, is a member of the Polk State College Foundation board of directors, and both he and Cady have supported a number of Foundation events. As noted by board chair, Bonnie Parker, Eric’s holistic approach to wealth management begins with the promise to provide his clients with the insights and perspective that, over time, can make a valuable difference in their lives. That philosophy has served him well on the Foundation board for the past three years, and he and Cady’s support has made a valuable, tangible difference in the lives of so many students. When addressing the trustees, both Eric and Cady shared how important giving back to the community is to both of them. They have made philanthropy part of their lives, and are working to teach their young children the importance of giving back as well. 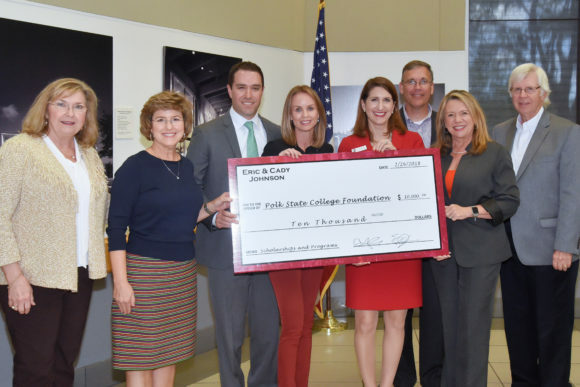 On behalf of the Foundation Board, District Board, and the students who ultimately benefit from your generosity, we express our utmost gratitude for Cady and Eric Johnson’s donation to support Polk State College students.